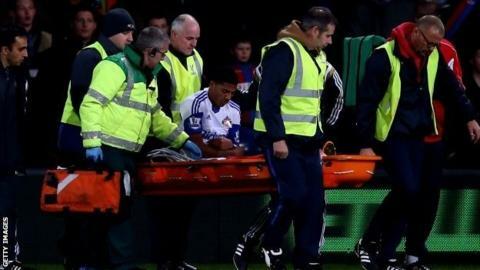 Sunderland defender Patrick van Aanholt requires a shoulder operation that will keep him out for three months. The Dutchman, 24, suffered a dislocated shoulder during his team's 3-1 Premier League victory at Crystal Palace. After Sunderland's 1-1 draw with Everton, Sunderland boss Gus Poyet said that Van Aanholt needs surgery. "Unfortunately Patrick is going to need an operation which means he is going to be out for two-and-a-half to three months," Poyet added. "It is a big loss, but we will help him and we will have to cope with it." Van Aanholt was injured when he tackled Palace's Wilfried Zaha during the first half of last Monday's clash at Selhurst Park. Poyet says he was happy with the ongoing improvement to Sunderland's defence following their draw with Everton. The Black Cats were thrashed 8-0 at Southampton last month, but have only conceded twice in their last two matches. "Football is becoming more and more about how you defend and how much you care about defending," said the Uruguayan. "The team was practically perfect apart from a couple of actions. We are working very hard at this point to show that we are back in business."